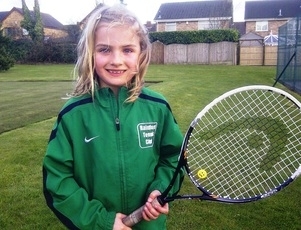 Rainford's Phoebe Mitchell has won the 8 & Under Girls Singles at last week's Widnes Tennis Open. Phoebe, who is coached Rainford Tennis Club by Steve Vincent, reached the final of the competition, held at Widnes Tennis Academy, where she beat Ilias Hirani Worthington 11-9. Also, in action was Rainford's Erin Scott who reached the semi-finals of the competition, which is part of the LTA Summer County Tour. "We are delighted that both Phoebe and Erin have been enjoying their competitions so far this year" said Director of Tennis, Steve Vincent. "They have both been working hard in their practice and are now seeing the benefits of that in their tournaments."